What a wild last 7 days we’ve had here fishing in the Tarpon Springs and New Port Richey areas. We’ve had absolutely gorgeous days and a few really rainy days. The rain has definitely changed things. The bait has moved, the fish have moved and we’ve had to change our habits to get on both. But thankfully, with a little work, the fishing has been really good. The hot ticket right now is sea trout. They have been well over average sized and we’ve been boating anywhere from 15 to 50 each day over the last 7 days. Fish up to 6lbs and 25″ have been brought to the boat and when they get that big they are a blast to catch. We’ve got a good 3 weeks or so left on the great trout bite before we switch our focus to 100lb+ tarpon so if you’re wanting some good eating fish for the grill give me a call. Bait has moved from some of it’s recent back water haunts out onto the flats. I suspect the recent rains have pushed them out of the quasi brackish areas. But we’re still getting it and that really helps with the fishing. 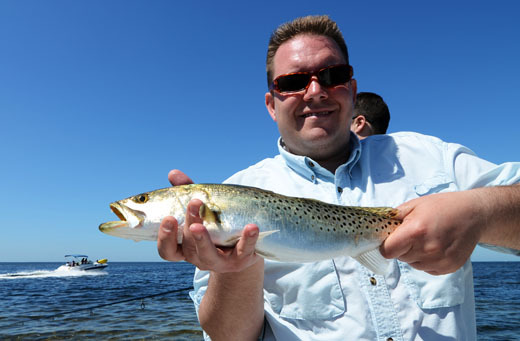 The reds and snook are still in creeks and rivers but the trout have moved out on the flats and around the barrier islands. Today was the first day we actually spent some time hunting for cobia and the 1st stingray we spotted had about a 20lber on it’s back. I went to grab and bait and when I turned around it was gone. We saw several more large rays but they didn’t have any cobes with them. But, that’s a good sign that we’ll be getting a few “brown bombers” to the boat real soon. Again, it’s spring time and the go to bait is scaled sardines. 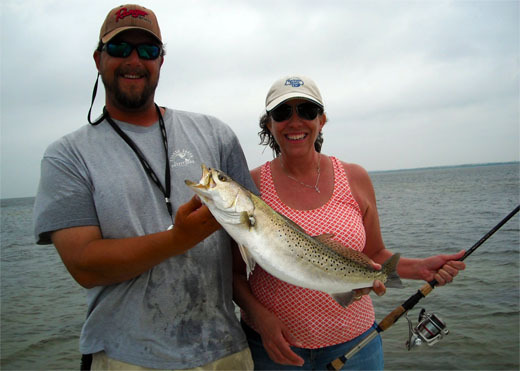 There are plenty of Mackerel, bluefish and trout around Anclote and they can make for some real fast action. The reds are just beginning to school up and though we haven’t gotten into any great numbers of them, the ones we’re getting are large (6-12lb range). The snook have been surprisingly good so far this spring and your chance on getting an “inshore slam” (red, trout, snook) is pretty good right now. Tarpon are starting to show up in St. Petersburg right now. I haven’t targeted them yet but I know a few people that have around the Skyway Bridge area and a few of them have hooked up. June is getting pretty full as far as tarpon charters go but there are still several dates for May and it is an awesome month for tarpon. So, if you’ve ever wanted to hook into a 100lbs of pure adrenaline, you need to give me a call and get out there in May.